This jumbo plastic baby bottle is the perfect addition to any of our adult baby costumes and over-sized baby costume accessories. It can be used as a center piece or as a party favor for baby showers or your child’s first birthday. 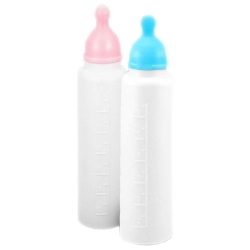 The jumbo baby bottle is available in blue or pink and measures 12” tall.